Energy Up! | Category Archives: Sugar SleuthingSugar Sleuthing Archives - Energy Up! When venturing into a coffee shop, most people search for an option that tastes yummy with as few calories and fat as possible. What people really need to be looking for is the option with less sugar. As Voltage and Energy Up! Promotes, sugar is what people have become addicted to and is a major contributing factor to diseases such as Type 2 Diabetes, high blood pressure, and Cancer. What people don’t know is that their hazelnut latte, caramel macchiato, or mocha is not just fattening, but nothing but sugar. The most often ordered drink at a coffee shop is most likely a vanilla latte or a vanilla coffee. Take the latte for example. If a person were to go into Starbucks and order a grande (medium) vanilla nonfat latte, they think they are doing well cutting out the fat and therefore reducing the calories. A grande vanilla latte at Starbucks has 4 pumps of vanilla in it. The serving size on the vanilla bottle says 2 tablespoons with 19grams of sugar per serving. Keep in mind that the recommended amount of sugar per 24-hour period is 24 grams. About two pumps of Vanilla comes out to 1 tablespoon, so at 4 pumps, that’s already 4 tablespoons and 38 grams of sugar in the latte. That’s the minimum amount of sugar in the latte given that the barista makes the drink to Starbucks standard and does not add any extra pumps of syrup, which often ends up happening. People also think that they can aid their health by choosing non-dairy milk, which would be true if the substitute has no added sweetener or sugar. At an establishment like Starbucks, they use vanilla soymilk, which has 13grams of sugar per 8 ounce serving…back to the grande vanilla latte scenario. 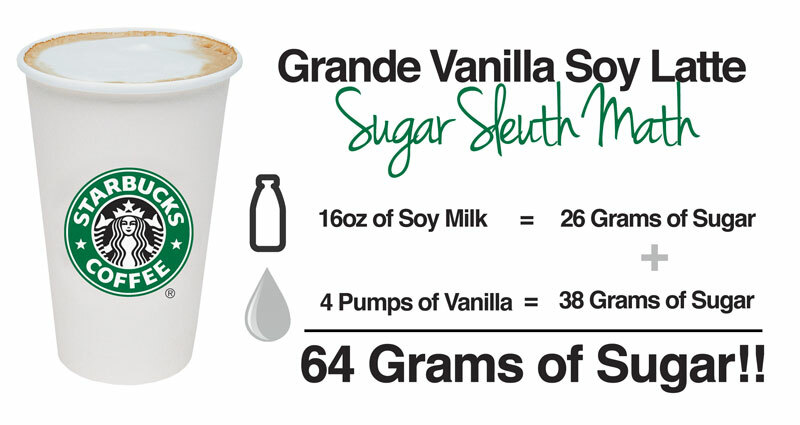 If someone orders a grande soy vanilla latte, they are adding an additional 26 grams of sugar to their order. This is because a grande drink is 16 ounces, and the soy has 13 grams per 8 ounces, so there’s double the sugar from the soy in the drink. is where the problem lies. Most people do not know that the sugar is the problem because people have become addicted to it. A great alternative to any sugary latte or coffee is a skinny version. If nonfat milk is not preferred, one can still use whole or 2% milk with sugar free syrup to still get the flavor in the latte without all the added sugar. If one wishes to cut out syrups in general, Truvia is an awesome natural sweetener that doesn’t add the grams of sugar but still makes drinks taste sweet. It’s important to stay Sugar Savvy and know where sugar is lurking. You may be surprised where sugar is hiding in your life. Salads are a great way to pack in nutrition and satisfy hunger, which people think is a great alternative to most foods that are bad for us. Sometimes, people don’t realize that salads can be horrible for you if they are not filed with the proper nutritious ingredients, like salad dressings. There are thick and creamy dressings like 1000 Island, Ranch, and Blue Cheese, which are filled with sodium and fats. Then there are the vinaigrette’s like balsamic, raspberry, and Italian, which have less fat, but still have a lot of sodium and sugar. To make their salad the healthiest it can possibly be, people tend to go with the vinaigrettes, and even though they may be reduced fat, fat free, or carb free, that doesn’t mean they are sugar free. Some of the most popular vinaigrette’s are the fruity and sweet tasting ones. Naturally, vinegar tends to not be a sweet tasting product, but the vinaigrette’s that people are drowning their salads in taste sweet because they have added sugar. For example, lets take a look at Kraft fat free raspberry vinaigrette. Kraft’s fat free raspberry vinaigrette is appealing to people due to the low calorie and fat content. They think that it’s a healthier decision to make to save calories, but it’s not always about the calories—people need to pay attention to what’s inside the food that they putting into their body. According to the Kraft website, their fat free raspberry vinaigrette has 9 grams of sugar per 3 tablespoon (1.5 oz.) serving. It’s easy to drown a salad in more than 3 tablespoons, which will automatically put the sugar content above 10grams, and to stay Sugar Savvy, that means only 24 grams in 24 hours, so at a minimum that would only leave 14 grams for the rest of the day. As Voltage often teaches, sodium is sugar’s sidekick. In this example, the Kraft fat free raspberry vinaigrette has 320mg of sodium per a 3-tablespoon serving. 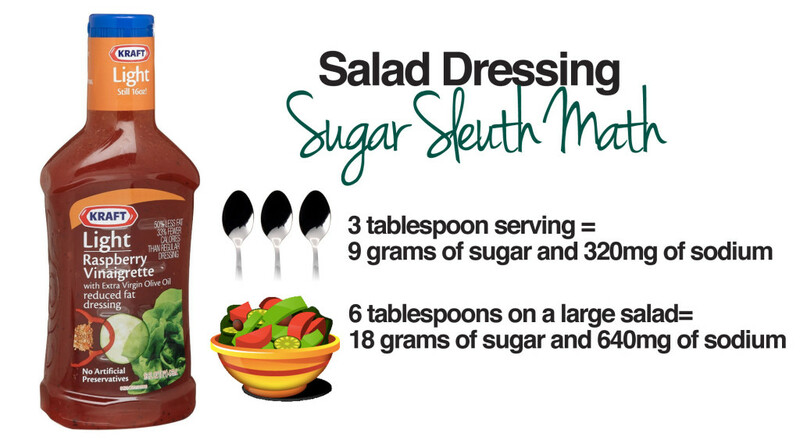 If one puts 6 tablespoons of this salad dressing on their salad, they would be eating 18 grams of sugar and 640mg of sodium. That’s a vast amount of sodium and sugar for a topping on a meal that it supposed to be healthy and nutritious. Even though it’s easy to assume that a healthy decision is being made with vinaigrette’s such as the Kraft one, it’s really what’s inside the food that people need to be worried about. Make sure next time that you go for that healthy salad, you really know that it’s healthy by paying attention to what you’re putting on top of it because the dressing can ruin the nutritious content. Make sure you know where sugar is hiding from you. In attempt to be as healthy as possible, people tend to turn to milk substitutes such as soymilk, almond milk, and lactose free milk. 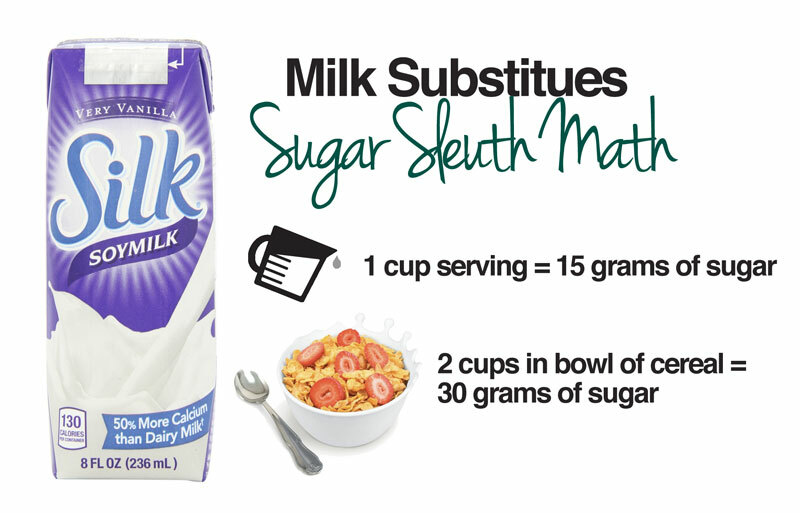 While, these substitutes often pose as a healthier alternative to regular milk, they can be filled with tons of added sugar and not sugar savvy at all. Take a look at Silk Very Vanilla soymilk. One serving of this soymilk is one cup, and according to the nutrition facts on the back of the carton, there are 15 grams of sugar in a one cup serving of Very Vanilla soymilk. So, if you were to put 2 cups in a bowl of cereal, or just drink 2 cups of it, that’s 30 grams of sugar in one sitting. That will put you 6 grams over the recommended 24 grams, and that’s just in an alternative to regular milk. As Voltage often talks about, salt is sugar’s sidekick, and in Very Vanilla soy milk from Silk, there is salt listed in the list of ingredients and helps to contribute to the overall sodium content of 110 mg of sodium, which is not necessarily a bad number, but just keep in mind the amount of salt in the milk substitute that you choose. To avoid added sugar and added salt, try unsweetened soymilk or almond milk to help keep you Sugar Savvy and Fit, Fab, and Fierce.